it’s that time! mid-october means autumn is in full swing—the leaves have changed colors, bakeries are stocked with pumpkin bread, and bloggers have flocked to the nearest pumpkin patch. of course, the girls and i had to follow suit. we greatly enjoy planning seasonally-timed road trips, and this month, we visited thomasson family farm. 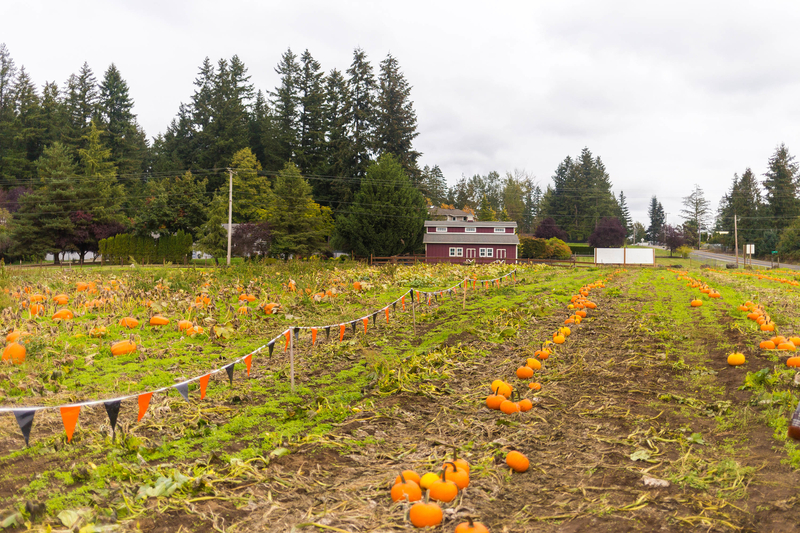 located in enumclaw, washington, thomasson offers you-pick pumpkins, a corn maze, wagon ride, petting farm, playground, cafe, and more! 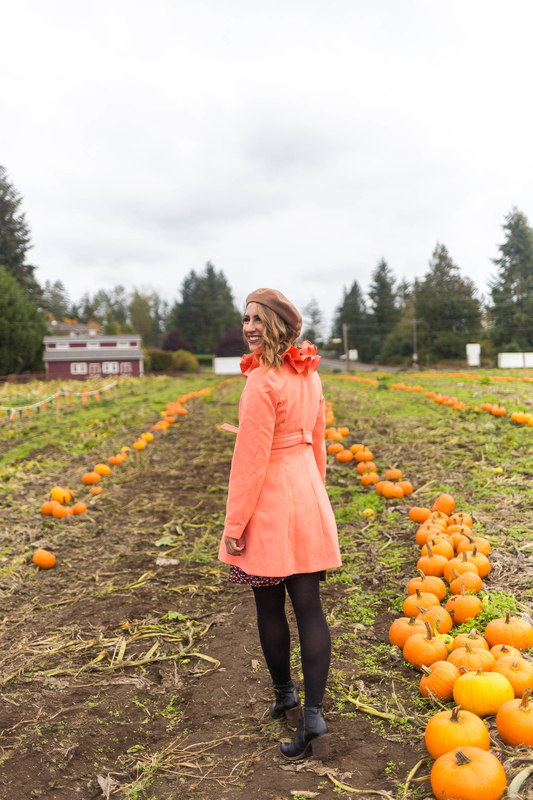 last year, we visited a pumpkin farm in snohomish county; this year, in an effort to try something different—and avoid crowds—we ventured south of the city. thomasson family farm is quaint, with ample parking and a variety of fun, festive activities. 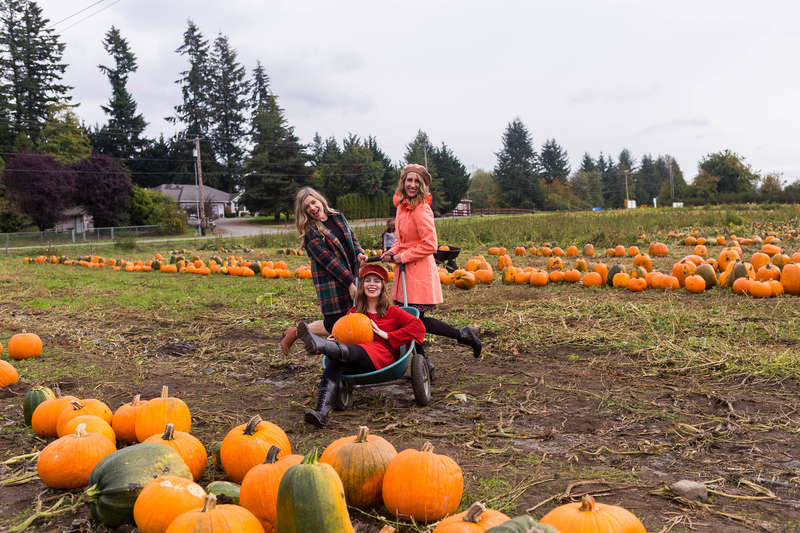 while it was a bit muddy (sorry, shoes), it provided the perfect backdrop for pumpkin-themed photos! jenn, from hello rigby, and ana luiza, from northwest blonde, and i packed our bags and hit the road on a sunny sunday afternoon. we had three outfits (each) in tow and couldn’t wait to arrive! (if you’re planning to visit a pumpkin farm—or simply want to take a day trip in your city—i put previously shared this post on how to plan and what to pack.) 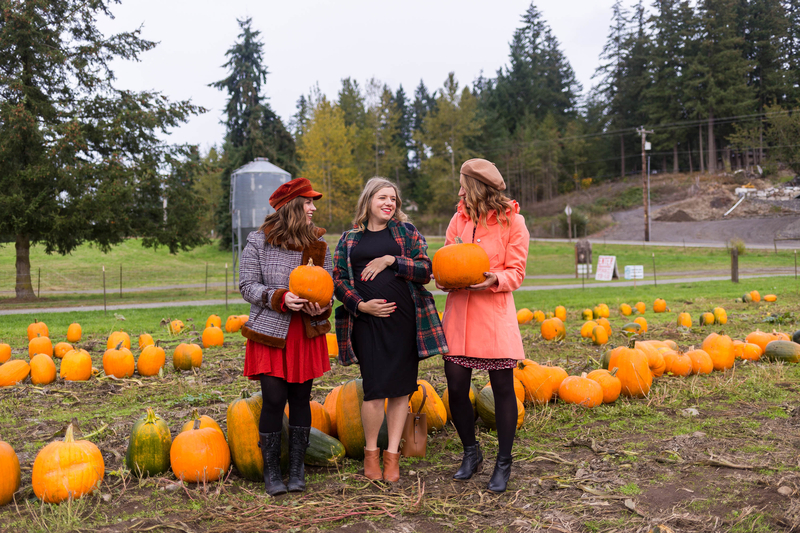 thomasson family farm is approximately one hour outside of seattle, and the drive provided ample time for us girls to relax and catch up! have you visited the pumpkin patch this year? if not, i’ve rounded up three potential outfits below! while i could have scavenged my closet for something to wear, i took the opportunity to browse the recent asos sale! i was in search of a fun, fall jacket—asos to the rescue! i purchased my orange wool coat for $35 +$8 for two-day shipping. it arrived just in time, and i couldn’t be happier with how it fit. i look forward to wearing this cozy jacket throughout the fall and winter months. who said the little black dress (lbd) isn’t versatile? had i not worn my dress and jacket combination, i likely would have worn something comparable to what ana luiza is wearing! i love her plaid jacket, lbd, and brown leather boots. an lbd is a wardrobe staple in any season. while pairing black and brown may feel like a fashion faux pas, i find it looks classy and chic! i also love jenn’s printed jacket. the faux fur on the collar and sleeves add an extra “pop”—and don’t worry, the faux fur feels just as soft as it looks. the girls and i had a wonderful time visiting thomasson family farm. while we missed popping into the cafe, we plan to include food (such as corn-on-the-cob, kettle corn, and pumpkin donuts) in next year’s adventure. have you visited a pumpkin farm this season? where is your favorite place to go?